If you've been to most of the burger shops in town, and your're still not satisfied, go to Biff Burger, 3939 49th Street N. The restaurant has been cooking their food to perfection for more than 20 years. Biff Burger has a wide selection of delectable dishes, including 13 types of gourmet hamburgers made from lean, fresh ground beef; tasty side dishes such as tator tots, French fires and cole slaw; sandwiches such as hot ham and cheese and beef and bean burrito; and breakfast dishes such as corned beef hash and pancakes. 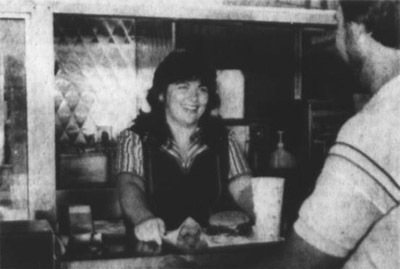 At Biff Burger, you'll get service with a smile and your burgers made to order. Some delicious gourmet burgers, which are charbroiled and made to order, include the Cheese Biff Deluxe, Super Bacon Cheese and Super Guacamole. You can order the delicious burgers from the drive-thru or at the window inside, and breakfasts are served by a friendly, prompt waitress at your table! You can have every meal made-to-order. Biff Burger offers three specials for breakfast and one special for lunch and dinner. For more information, call owner George Musser at 527-5297.